It sounds like a childhood riddle: What has no eyes, but sees with its whole body? However, the genetics and corresponding physiology of sea urchins are far from childish. Despite the species originating 540 million years ago, these echinoderms share many genes with us humans. The question of sea urchin vision had long puzzled researchers. There were no visible eyes, but these creatures were obviously capable of reacting to changes in light levels. Recent advances in genetics, allowed scientists to look into the urchin genome, where they noted the presence of several genes associated with retina development. Despite having no eyes, urchins have a lot of the blueprints for eye proteins and photoreceptors. Researchers then traced the presence of opsin (a protein) to the tips and bases of the urchin’s tube feet where photoreceptors allow them to react to light or dark. And eye genome sequencing is not the only DNA that we share with these spiny marine residents. Purple urchins have 7,000 genes in common with humans – including genes associated with muscular dystrophy, Parkinson’s, Alzheimer’s, and Huntington’s diseases. And while sea urchins don’t develop any acquired immunity, their innate immunity is far greater than humans with up to 20 times more genes devoted to their protection. 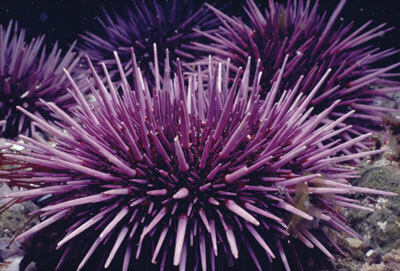 Sea urchins are exceptionally long lived, some living up to 100 years. This incredibly healthy immunity and their comparable DNA to humans, make these echinoderms vital organisms in answering many questions about these diseases and potentially providing cures. Further evidence that life in the ocean supports and sustains us on land.